ShortStack Apps on Mobile Devices, FINALLY! Ok this is straight from ShortStack so sorry for the formatting, but I wanted to get it out here! 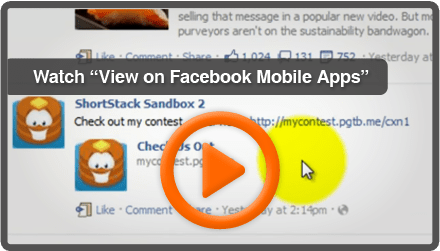 Want users to view your apps on mobile devices? If so, you’ll need to provide them with the app’s Smart URL, since Facebook does not show apps on mobile by default. The Smart URL allows ShortStack to detect if the user is on a mobile device and serve them the appropriate content. 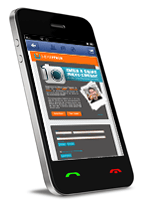 Our mobile capabilities are available to all users, even those on Free Plans! Where do I get a Smart URL? Once your app is installed to your Page, ShortStack will provide you with a “Smart URL” to use when promoting your app. You can find your Smart URL in two places. Login to your ShortStack account. Navigate to your tab in the Tab Designer. Click on the orange Manage Installs button. Under the Smart URL column, you’ll see the respective Smart URL listed for your installed Tab. When linking to your app, use your smart URL to make sure your tab is accessible on mobile devices. You will need to create a status update (or something similar) and include the Smart URL link. An example of a post would be “Trying to access our contest via a mobile device? Click here (SMART URL) to view the contest!” For further instructions, click here to check out our Mobile doc. Don’t feel like reading the doc? Don’t worry, just watch the video instead.